Contact your Senators and tell them to vote NO on the dangerous Kirk-Menendez and Corker bills! 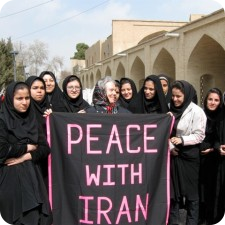 Buy a CODEPINK t-shirt today to proudly display that you want Peace with Iran! As the delicate nuclear negotiations between the US and Iran continue, members of Congress are ramping up their efforts to undermine these talks, including two bills that would push the US away from diplomacy with Iran –– and further towards war. The Corker legislation (S. 615) would allow Congress to veto a nuclear deal and prevent the sanctions from being lifted, and the Kirk-Menendez bill (S. 1881) would impose even harsher sanctions. The Obama Administration has warned that this legislation risks driving the Iranians away from the table. This could push the US to the brink of war with Iran. Now 47 Republican Senators have gone even further. Behind President Obama’s back, they sent anopen letter to the leaders of Iran saying any deal reached by president Obama would not be valid under the next president. We need Senators to take a stand for diplomacy.Tell your Senator now that the diplomacy-killing bills S. 615 and S. 1881 would drive the US away from negotiations with Iran and put us on a path to war. PS: You can do even more by taking a moment to send a Letter to the Editor of your local paper to advocate for the negotiations to continue!